Govind P. Agrawal is a professor at the Institute of Optics at the University of Rochester and a Fellow of both the Optical Society of America and the Institute of Electrical and Electronics Engineering. He is also a Senior Scientist at the Laboratory for Laser Energetics. Dr. Agrawal is author or coauthor of more than 300 research papers, book chapters, and monographs. 2.3 Dispersion in Single-Mode Fibers. 2.7 Fiber Design and Fabrication. 5.4 Sources of Power Penalty. 7.1 Compensation of Fiber Losses. 7.6 Receiver Sensitivity and Q Factor. 7.7 Role of Dispersive and Nonlinear Effects. 7.8 Periodically Amplified Lightwave Systems. 8.1 Dispersion Problem and Its Solution. 8.6 Channels at High Bit Rates. 9 Control of Nonlinear Effects. 9.1 Impact of Fiber Nonlinearity. 9.2 Solitons in Optical Fibers. 9.5 Control of Intrachannel Nonlinear Effects. 10.3 Shot Noise and Bit-Error Rate. 10.5 Impact of Nonlinear Effects. 11.1 Nonlinear Techniques and Devices. C General Formula for Pulse Broadening. This new updated edition incorporates recent advances that have occurred in this area including new chapters dealing with advanced modulation formats and new techniques for optical regeneration. 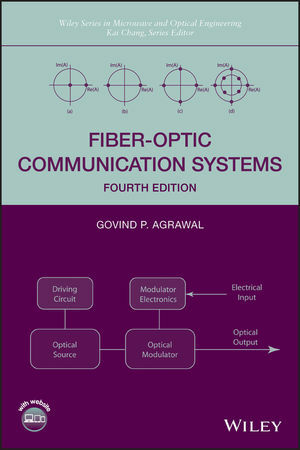 The book has been fully updated to reflect the latest advances and includes two new chapters one dealing with advanced modulation formats (such as DPSK, QPSK, and QAM) and the other with new techniques such as all-optical regeneration.